The origin of Lavardens is lost in the mists of time. 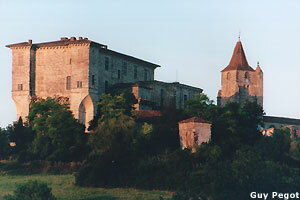 The counts of Armagnac made of it their principal residence in XIIe century and built a powerful fortress there. Several times destroyed, it was definitively dismantled by the troops of king de France in 1496. Given by Henri de Navarre to Antoine de Roquelaure in 1585, this one undertook there the construction of a new residence since 1620. Casteland.com particularly thanks association for the castle for the texts and the photographs as well as the information on this one. - on April 1 at June 30 of 10h 30 with 12h30 and 14h with 18h. - on September 1 at October 31 of 10h30 with 12h30 and 14h with 18h.